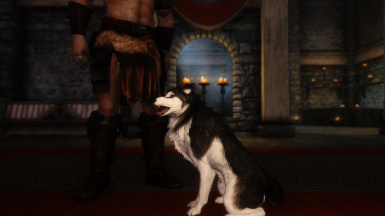 Garm is an husky companion (REQUIRES DAWNGUARD). 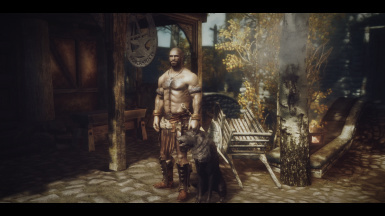 He can be found with Andurs in the Whiterun Temple of Arkay. 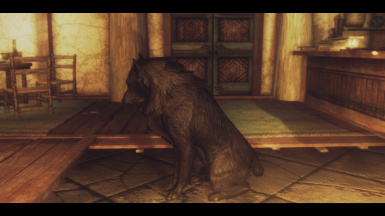 He is named after Garmr, the guardian of the Norse Underworld. He has many versions and styles, hopefully something for everyone. 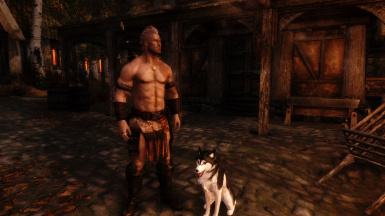 Darkfox127 for his excellent tutorial on making animal companions. 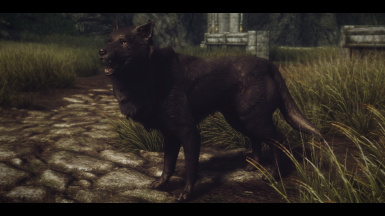 Bellyache for his white and black wolf textures: http://skyrim.nexusmods.com/mods/3621/? gtf323 for the main image of Garm I am using for the mod. 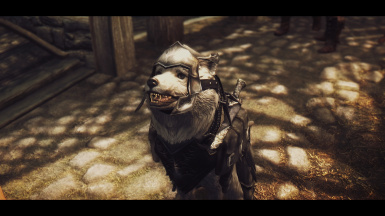 tumbajamba for his husky armor: http://www.nexusmods.com/skyrim/mods/8978/? Anataron for bouncing scripting ideas around with me. To all the folks to created the Wiki Papyrus Creation Reference, especially the example script for summoning a follower. 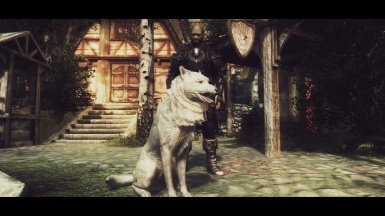 To the website Skyrim MW for their tutorials. Thanks to everyone who submitted images - I have used some of the user images on this page. Loaded up correct size for Mini-Garm no-armor version. - Large update as I have created a special ability for Garm. It is a voice based lesser power that will call Garm to your side should he wander off and get lost. This new ability opens a portal in the Underworld and since Garm can travel to the Underworld at will it means he can use this portal to answer your call. He had Andurs write down the spell in a spell tome and Garm keeps it with his toys at the Hall of the Dead. If you ask him to trade nicely he will share the spell tome with you. - In general terms this is a script that uses the summon portal effect in the base game and then moves Garm in front of you wherever you happen to be. I had various options but since Garm is a supernatural creature I felt this fit his lore best and was also cool looking. Note that the spell will only summon Garm if he is following you. If the spell is cast when Garm is not following you then the portal will open but Garm won't use it. On the other hand if you have told Garm to wait some place (like the start of a dungeon) you can use this spell to summon him to your side later on in the dungeon. I like doing this for stealth missions. 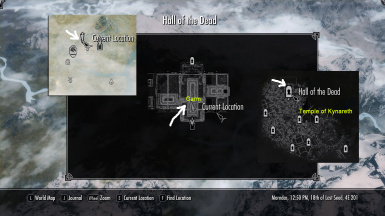 - Instructions: I recommend loading current game, dismissing Garm at the Hall of the Dead, then saving. Exit and remove the mod, install the new version, start the game and you should be all set. You don't have to take the spell book if you don't want. If you do learn the spell it is permanent. If you uninstall the mod the spell will vanish but probably remain baked in the game somewhere, much like when you use a custom weapon and then remove the mod the weapon vanishes. This has never caused an issue for me but up to you. - I updated all my versions (and what a total PITA that was, took my entire Sunday almost). The True Wolf versions were also tested and worked. I can't update the German translations though so those will remain without the new spell unless someone feels ambitious and wants to translate, test, and give me the files to host. - Hope you all enjoy this new ability. I know enough scripting now to make a set home command but still debating if I want to as I like him with Andurs. But may toy around with it as an option if I get in the mood at some point. - Added Shadow Garm the Reaper of Souls. As a Guardian of the Underworld Garm reflects the balance of Good and Evil, Life and Death, Light and Darkness. Here is his darker side, the one that must deal with the shadows of death from those with dark sins on their souls. 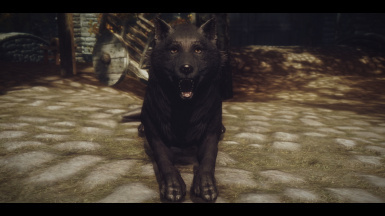 This is a smokey black wolf texture with amber/yellow eyes. - Revamped the front page with new graphics, images, fonts. Cleaned up all the text to make it better organized and added information on install, uninstall, help, recommended mods, incompatible mods, and details of what the mod does/is. - Added more images to the authors section. 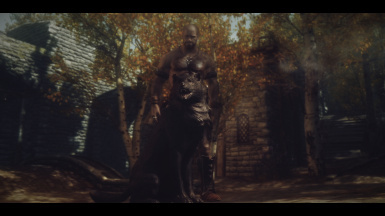 Added Garm with Ebony Armor - now he is a real tank! Created white-husky version. 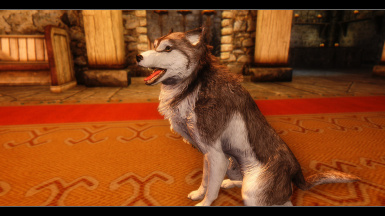 This uses a custom NIF file based on the Husky model and uses the white wolf texture from Bellyache. 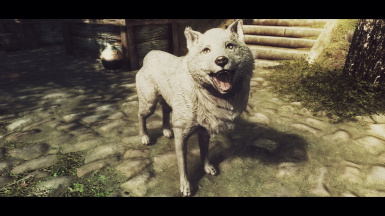 Since I used a custom NIF and custom Texture only Garm should show up as a white husky. No version change, just added another optional texture - all white with red eyes per requests to make a "Ghost" version of Garm ala Game of Thrones. Added any of the stealth perks and abilities, I thought he might be able to use, to his actor class. Added Perks - +40% reduced stealth detection, muffled movement, shadow warrior (not sure if it will work yet), silence. He already had light foot. Update 2013-07-23 added a Garm Senior (scale 1.12) with no armor. 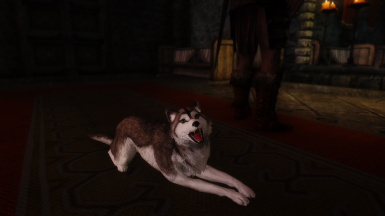 Garm is a fierce husky named after his father Garmr, the guardian of the Norse and Nord underworlds. His mother is Jörð (Jord; Earth), one of the Jötnar. Feeling curious about the realm of Akray she disguised herself as a wolf and flirted with Garmr as a way to get in. 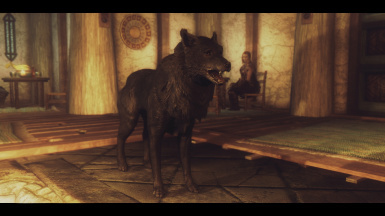 Garmr was not fooled but he agreed to answer her questions if she would bear him a son, to which she agreed. The son she bore was Garm. He was born during the Warp of the West in the third era, around 3E 420, and is still considered a young pup by those in the Underworld. Like his father he helps protect the gateways between life and death and his main function is to guide lost souls to their appropriate destination in the afterlife. Because of his mother he has strong ties to the natural world and thus makes a good shepherd for guiding souls between the two realms. His appearance often changes to reflect the role he is undertaking. 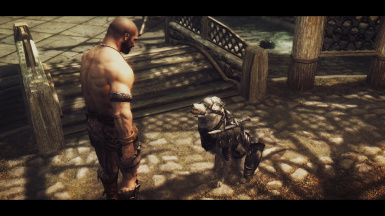 Sometimes he is a friendly guide to children, often appearing as a small puppy, while other times he will be a massive and well armored husky-wolf to guide and help mighty warriors. When guiding good souls he often appears with white fur but when hunting down evil souls he may appear with smokey black fur the color of shadow. As a Guardian of the Underworld Garm also reflects the balance of Good and Evil, Life and Death, Light and Darkness. His loyalty is to those who are kind to him and return his steadfast loyalty. 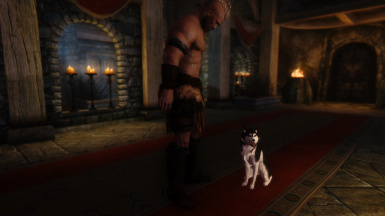 However he is still too young to assume his fathers position in the real underworld, so he got a job helping Andurs at the Hall of the Dead in Whiterun. 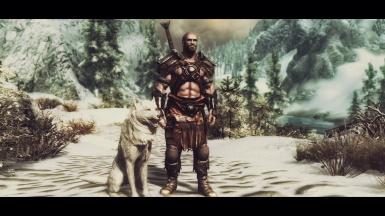 But what he really wants to do is go on grand adventures and explore the world of Skyrim and its many realms and holds. Because the mortal world is so new and exciting to Garm he sometimes wanders away and may become separated from you. So Garm asked Andurs to write a spell tome that will teach Garm's friends how to call him from anywhere in the world. 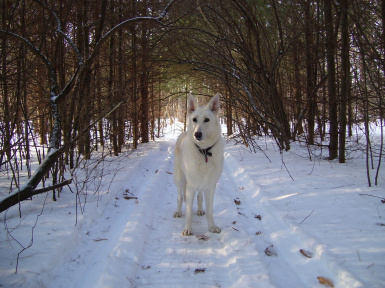 It opens up a portal, via the Underworld, and Garm is able to move through the portal to the one calling him. Simply download the particular version of Garm you wish to take with you on your adventures and install with NMM or manually. 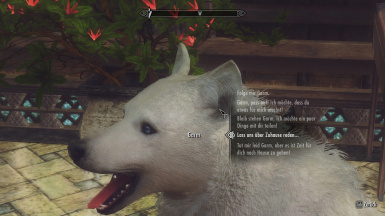 When installing make sure you have no other animal companions active in the game and that you player animal count is set to 0, otherwise Garm may not want to talk to you. In general load him before other mods like better stealth AI, Amazing Follower Tweaks, or mods that may be needed to alter his behavior. To learn how to call Garm simply ask him to share his stuff with you and you can find the Spell Tome: Call Garm in his inventory. The spell will summon Garm to your side when used but only if he is following you. If you use the spell and Garm is not following you it will still open the portal to the Underworld but Garm won't use it; he only comes to those he is following. Note: Requires Dawnguard DLC to play. 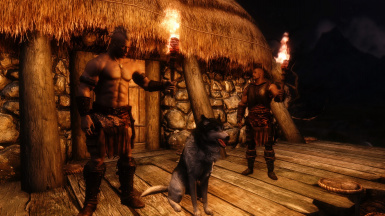 To uninstall load up your current game and dismiss him, ideally you should dismiss him where you found him - in Whiterun at the Temple of Arkay with Andurs. After you have dismissed him make a new save game. Then go and uninstall the mod, load your new saved game, save again. Now you should be all set. 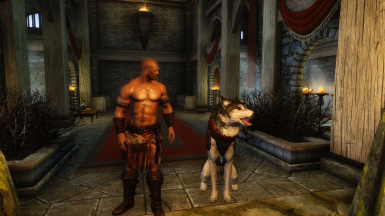 Adds Garm, a husky-wolf hybrid companion for the player. 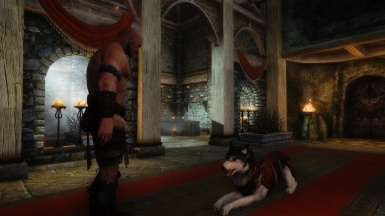 Garm currently works for Andurs at the temple of Arkay in Whiterun, protecting the entrance to the crypt. 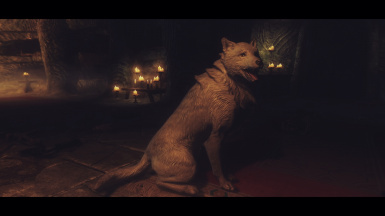 Garm has his own dialogue, although it is based off the standard animal companion scripts. Garm has a spell book that can teach you how to open a portal to the Underworld and call Garm to your side from anywhere in the world. Set to unaggressive to help avoid running out in battle while in stealth. Confidence is brave. Has light foot perk so he won't set off traps (or shouldn't at least). Also muffled movement, silence, shadow warrior, and +40% reduction to stealth detection. 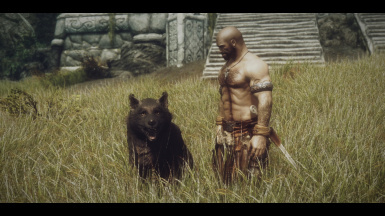 If dismissed he will return to where you found him, at the temple of Arkay in Whiterun. 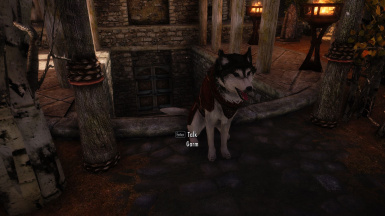 Garm comes in a variety of sizes but you can easily change his size to whatever you like using the console command "setscale" which will remain in your saved game from save to save. 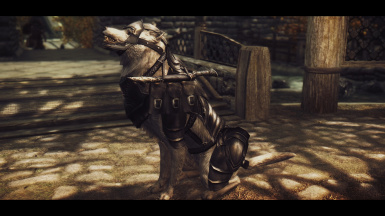 All textures are either vanilla or come from Bellyaches Animal and Creature Pack by Bellyache (husky mixed colors, white, and black) and some come with armor and some without. 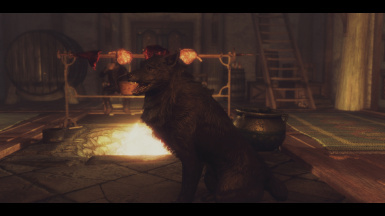 Shadow Garm the Reaper of Souls is a smokey black husky-wolf hybrid version of Garm with amber/orange eye. Garm - German translation of all versions thanks to Queenieangel. See German text image for the dialogue. Garm - Spanish Translations of all versions thanks to Zaxon007. You can download here or as his nexus upload page. While I have given Garm whatever stealth abilities and flags I could find there is still the issue of the AI. You might want to consider trying the Better Stealth AI mod to help with that. 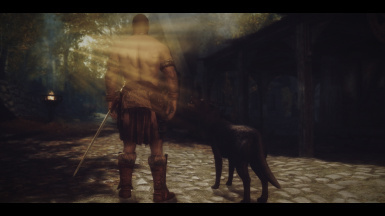 Out of the various follower mods on Nexus I found Amazing Follower Tweaks works best with Garm: http://www.nexusmods.com/skyrim/mods/15524/? 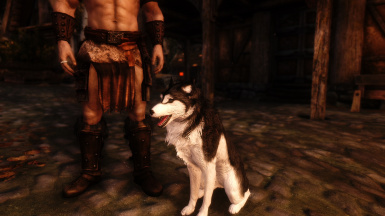 Another mod by Aenkill has 4 very well done husky textures, check them out: http://skyrim.nexusmods.com/mods/36021//? 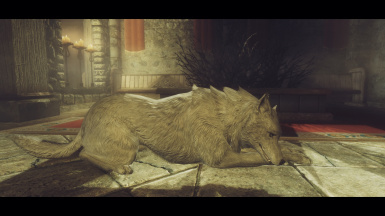 The mod True Wolves Of Skyrim by KrittaKitty and ShimoOkami has a set of textures made special for use with Garm (direct download) for use with the White, Ebony, Ghost, or Shadow versions. 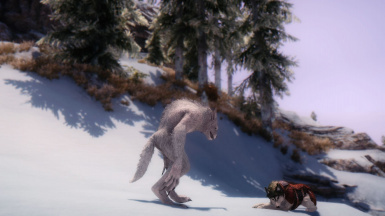 Any mod that alters default animal or companion follower scripts may cause a conflict. 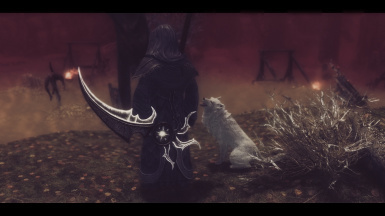 I have heard reports that EEF Follower mod does not work with Garm. 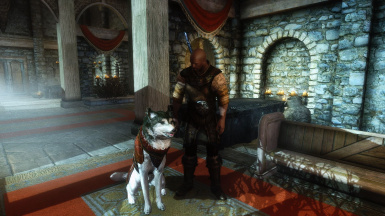 Also the Hearthfire DLC is not supported (Garm can not be set as a pet for children ... nor would I want him to be). 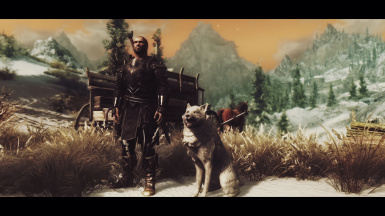 The mod, My Home is Your Home, does not work with vanilla animal followers (which Garm is based on) so while this mod won't conflict with him it also won't work. If you want to change his home I suggest using AFT. 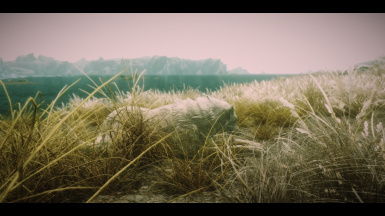 Any mod that adds a brand new world could possibly leave Garm stranded if dismissed as his AI may not know how to get him home. 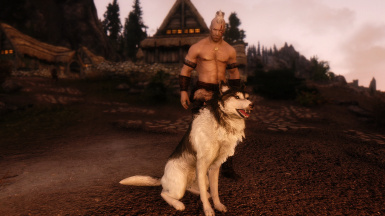 For example in Wyrmstooth there is a quest where you gain a pet wolf. 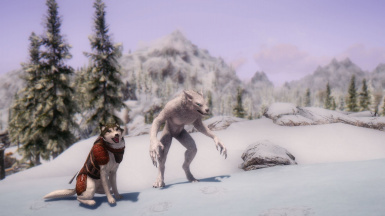 If you are not using a follower mod for multiple pets this quest could dismiss Garm when you accept the wolf pet.Garm then may get "lost" trying to get home. Best thing to do is either leave him at home on these types of mods or keep a close watch on him. A good thing is to write down his reference ID when you go to the new lands (not BASE ID, the reference ID). Then if he gets lost you can use the console command PRID to target him, then use "moveto player" and that will summon him to your side. Actually I always keep my animal followers reference ID's recorded as it makes them easier to summon. Just be aware the reference ID can change if you change your load order on mods in such away that it would change the first two values on the reference ID. Follower Mods: Follower mods like (EFF, UFO, AFT) may or may-not work with Garm depending on load order and other mods involved. EEF does not work from all reports. UFO works somewhat. AFT will work bit can be a little tricky. 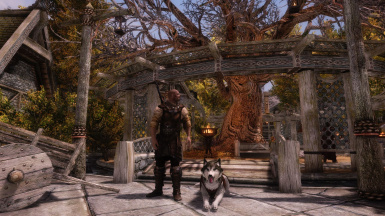 I find that if I recruit Garm (especially when I have other animal followers already) that he will use the vanilla scripts to join. If I want AFT to actually manage him I have to use the "make follower" spell that comes with AFT. You can safely ignore all the warnings. 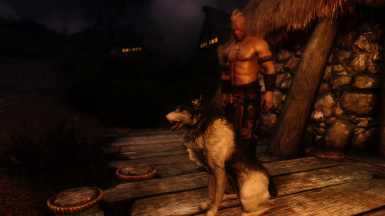 After that he seems to work fine with AFT and you can then have multiple animal companions. Hearthfire Pet: Garm can not be made a pet to children so don't even try. 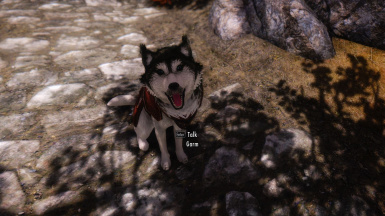 Garm Won't Interact in Combat: Garm won't trade or follow commands in combat. 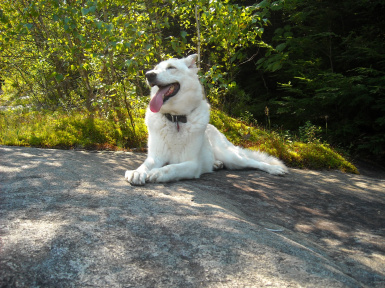 If Garm's health gets to low he will ignore you as he is to weak to respond. If you heal him up or get him out of combat so his health comes back then he should return to normal. Garm is Mad at You: You keep hurting Garm and he becomes aggressive. Well don't do that! If you hit him by accident to many times he may stay in combat mode. Try selecting him then enter console mode and type "disable" followed right after by "enable". You can also try the command "resetai" which sometimes help. 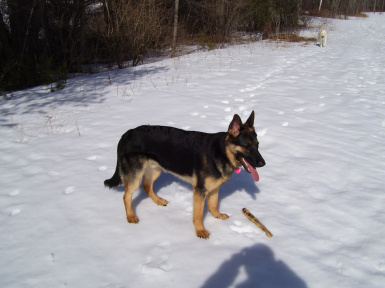 Garm is Lost: Garm is lost and you can't find him. Well use the spell he tught you, Call Garm, to summon him to your side. You can learn the spell from the spell tome he carries with him. If for some reasons you can't use the spell then you will need to know his reference ID (do NOT use his base ID). Then enter the console mode and type: PRID # (where # is his reference ID). This will select him no matter where he is. Then type: moveto player (this will teleport him to you). If you do not know his reference ID you need to either load an earlier game where you can select him in the console, which will display it, or look it up in the CK. Whatever you do, do NOT use "placeatme" to get him. That command makes a copy and will cause all kinds of problems. Garm and Doors: Like all the dogs in the game he isn't very good with doors. So if you send him home it may be a bit before he can get back into his home with Andurs. Garm and Damage: Browncoat22517 did some testing to see how damage works with Garm and pasting this here for others who may want to increase Garm's damage output. "I gave Garm the Fists of Steel perk (from the Heavy Armor tree), which adds a base unarmed damage increase, depending on the armor value of which gloves/ gauntlets are equipped. I gave Garm some tempered steel gauntlets and saw a significant increase in his damage output. So basically, Garm's attacks are based on unarmed damage."